This creamy chicken pesto pasta recipe is comforting, delicious, and super easy. It’s fast even if you make your own pesto from scratch! Ready in under 30 minutes. Homemade pesto is one of those classic foods that never really go out of style. Pesto was really popular in the 80s and 90s in North America, and while it never went away entirely, it’s making a resurgence. I always recommend making pesto at home because the flavors will be bolder, brighter, and fresher than if you buy the kind in the jar. 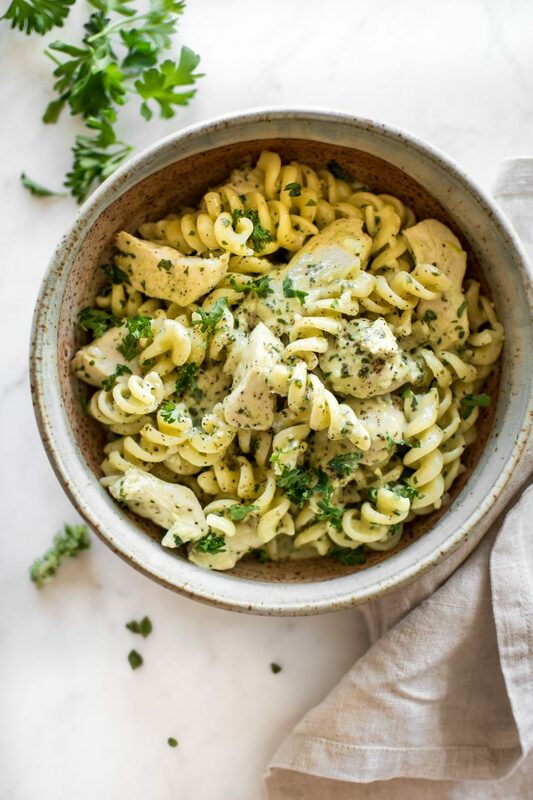 With that said, if you do have a jar of pesto, this creamy chicken and pesto pasta recipe will be even quicker and easier. Add basil, pine nuts, garlic, parmesan cheese, and salt & pepper to a food processor. Slowly drizzle in olive oil until you’ve got a smooth mixture. See my basil pesto recipe for more details. Pro tip: This creamy pesto pasta is delicious the way it’s written, but if you do want to give it a little more zing, adding some lemon zest, extra garlic, and/or red pepper flakes will take the flavor up a notch. And don’t forget to toast those pine nuts! Have you ever made pesto at home? 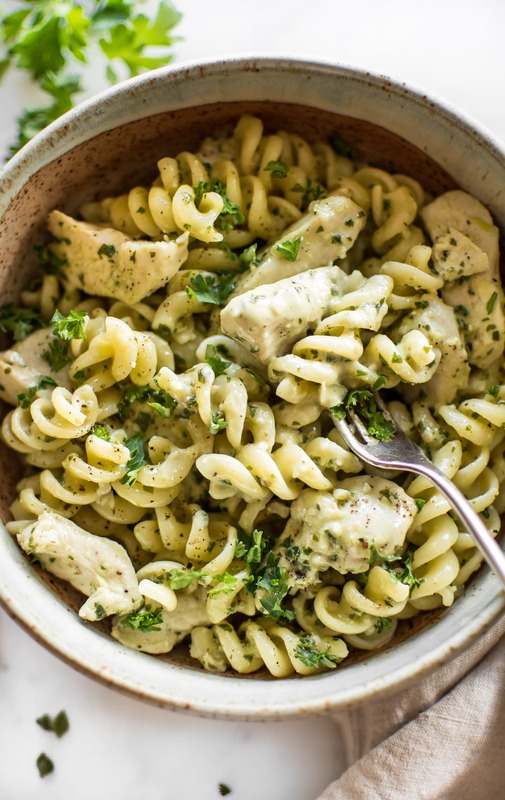 Will you make this easy chicken pesto pasta? 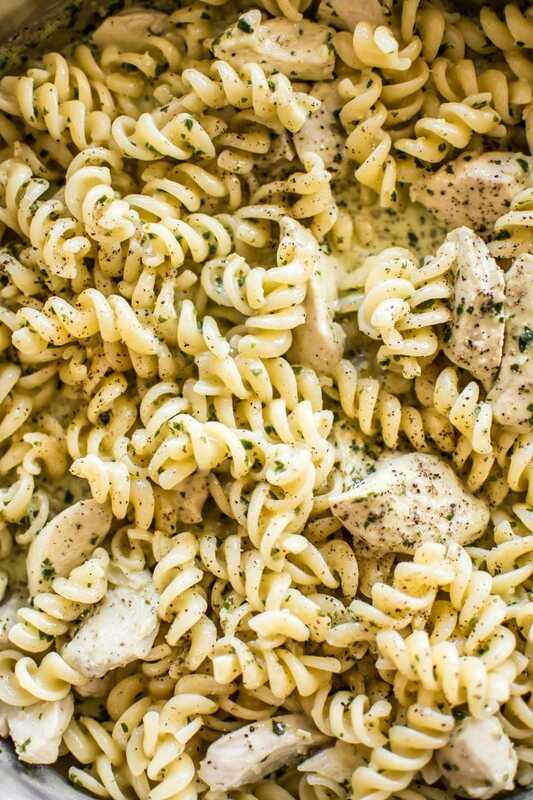 This creamy chicken pesto pasta recipe is comforting, delicious, and super easy. It's fast even if you make your own pesto from scratch! Ready in under 30 minutes. Boil a large, salted pot of water for the pasta. Cook al dente according to package directions. 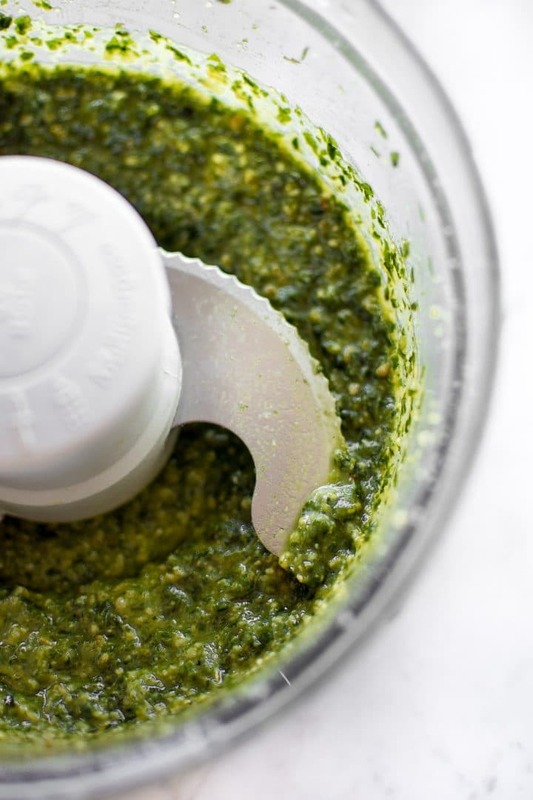 If making pesto from scratch, start it as soon as you put the water on the stove. Meanwhile, prep your chicken and add it to a skillet along with the olive oil. Stir until the chicken's coated, and sauté for 3-4 minutes. Add the pesto and cream to the pan, and let it simmer for 5 minutes. Drain the pasta and add it to the skillet; toss with the sauce. Let it cook in there for a minute or two. Season with extra salt & pepper if needed, and add the fresh parmesan if using. Love easy pesto recipes? You may also like my chicken pesto pasta salad recipe.